New and Future Developments in Microbial Biotechnology and Bioengineering: Aspergillus System Properties and Applications provides information on emerging issues related to recent advancements in aspergillus research and its applications in bioprocess technology, chemical engineering, genome biology, molecular taxonomy, secondary and metabolite production, industrial process and biofuels/bioenergy research, and alternative fuel development. The book covers the various novel enzymes secreted by these fungi and their specific use in the food, textile, pulp and paper, biocellulosic ethanol production, and other industries. 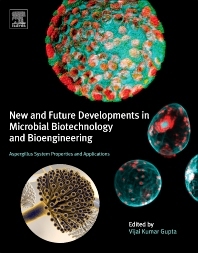 The book describes research and experimentation on aspergillus activity and directly connects them to their use in bioprocess technology, chemical engineering, bioremediation process, secondary metabolite production, pharmaceutical processes, protein production, industrial process, biofuels/bioenergy research, and alternative fuel development. Readers will find this book to be an indispensable resource for biotechnologists, biochemical engineers, biochemists, microbiologists, bioinformatics researchers, and other biologists who are interested in learning about the potential applications of these fungi. Bioengineers, Biochemical Engineers, Biochemists, Biotechnologists, food technologists, enzymologists, and related Professionals/ researchers. Graduate and postgraduate students, researchers and microbiologists, mycologists. Immobilization of β-Glucosidases from Aspergillus sp. Dr. Vijai Kumar Gupta is the Senior Scientist, ERA Chair of Green Chemistry, Department of Chemistry and Biotechnology, School of Science, Tallinn University of Technology, Tallinn, Estonia. He is on research leave from MITS University, India. Before joining NUIG, he worked as Assistant Professor of Biotechnology, FASC, MITS University, Lakshmangarh (Sikar), India. His area of expertise includes mycological research and plant-microbial interactions, bio-fuels and bioenergy research, and microbial biotechnology. He completed his Ph.D. in Microbiology from Dr. R.M.L. Avadh University, Faizabad, UP, India in 2009. He is one of the experts in the area of fungal biology and biotechnology. He is the active member of International Sub-commission on Trichoderma and Hypocrea, Austria and a working group member of the International Society for Fungal Conservation, UK. His work with Fusarium spp., Colletotrichum gloeosporioides, Aspergillus spp. Penicillium spp., and Trichoderma spp. has been complemented by contributions to biotechnological development, molecular diversity, disease diagnostic, plant pathology, fungal-plant interaction, secondary metabolites, and industrial applications. Dr. Gupta is the Fellow of Prestigious- The Linnaean Society, London, UK; Fellow of Hind Agri Society, India; Fellow of Society of Applied Biotechnologist India; and Fellow of International Society of Contemporary Biologist, India. He has been honored with several awards in his career including the prestigious Indian ICAR Senior Research Fellowship and Indian Young Scientist Award 2009, 2011 & Gold Medal Award-2009 for his advanced research achievements in the field of fungal genetics and biology. He is the Editor-in-Chief of the International Journal of Plant Pathology, USA; Senior Editor of Fungal Biology & Biotechnology, BioMed Central; Series Editor of a book series on fungal biology, Springer; and regional editor (Asia)/editorial board member of several International and national journals with many research/review publication/book chapter publications. He has edited about 16 books for publishers of international renown such as CRC Press, Taylor and Francis, USA; Springer, USA; Elsevier Press, The Netherlands; Nova Science Publisher, USA; LAP Lambert Academic Publishing, Germany; and CABI, UK.